Looking for a healthy alternative to grilled potatoes? Then it’s time to get those plantains on your beloved grill! Plantains are often mistaken as bananas because of their similar look, but keep in mind, these are two very different fruits. Though plantains are technically fruits, they should be considered and cooked as vegetables. In other words, while bananas can be eaten raw, plantains need to be cooked, mashed, boiled, fried or grilled… yes, grilled! Before we get to the goodness of grilled plantain recipes, let’s make sure you know this fruit very well, including how to select the right ones at the grocery store. When compared to bananas, plantains are longer and have thicker skin. A great thing about this fruit is that it’s good to eat in each of its three ripening stages: green, yellow and black. When green, plantains are ready for consumption, but will taste salty; when yellow, they taste sweet; when black, plantains are at their sweetest – so don’t even think of tossing them out, as they are great for grilling! It gets better – plantains are available all year round! So, run to the grocery store and grab some Turbana plantains because we’re about to get to the tasty part of this blog. You can also win a package of plantains by simply commenting on this post. Click here for the rules. We will randomly select 5 winners on Tuesday, July 22nd at 9:00am ct.
Below we have two of our favorite grilled plantain recipes, enjoy! 1. Combine brown sugar, lemon juice, margarine and cinnamon, and set aside. 2. Peel plantains and cut half lengthwise. 3. Grill plantains for 4 min. 4. Drizzle mixture evenly over plantain halves. Grill for an additional 3 minutes. 5. 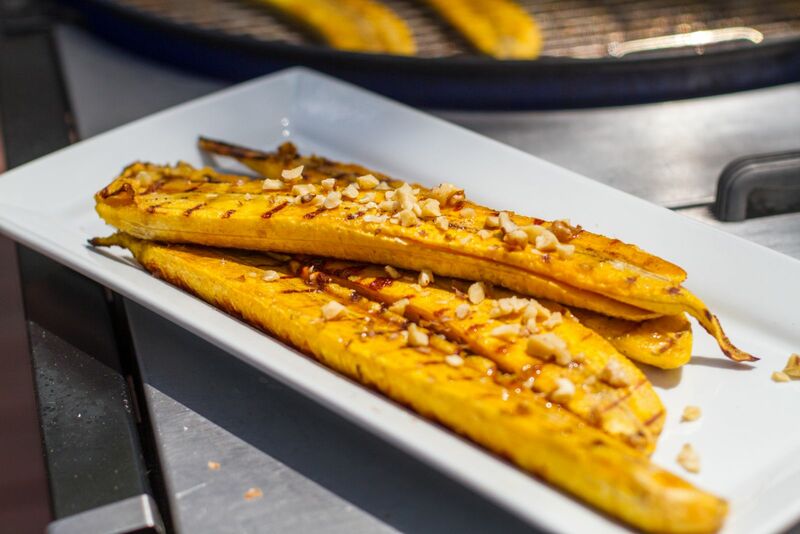 Place grilled plantains on a plate and sprinkle with toasted walnuts. 6. For extra goodness, serve with low-fat frozen yogurt and drizzle with any remaining sugar mixture. Enjoy! 1. Toast cumin seeds in a small skillet over high heat for about 30 seconds. Grind the seeds with a mortar and pestle. 2. Heat olive oil and garlic along with the toasted cumin over medium-high heat and cook for about 2 minutes, until garlic begins to sizzle. 5. Preheat grill to high heat. 6. Cut unpeeled plantains in half lengthwise and brush lightly with olive oil. Place on grill, skin-side down, and cook until soft (about 3-4 minutes on each side). 7. Place plantains on a plate and serve with the mojo sauce. Win a package of plantains by simply commenting on this post. Click here for the rules. We will randomly select 5 winners on Tuesday, July 22nd at 9:00am ct.
Our winners are: Diana S, Matt T, Ryan T, Neil A and Andrew B. Congrats!! Check your email!